Compared to few other watches which are built to make a ticking sound, as the second hand jerks all through 360 degrees, the Rolex’s second hand has a perfectly smooth motion, thus leaving no room for any ticking sound. If your Rolex watch has a ticking sound, then it’s not genuine. 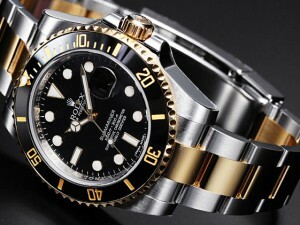 Authentic Rolex watches come with crown logos located on the top-middle of its dial. So in-case you are buying one without a crown logo, don’t hesitate to walk away: it isn’t real. Needless to say, Rolex watches are usually very expensive, and if you find one that is unusually cheap, give a second thought to it, and make sure you analyze it properly, because it’s very much likely to be a counterfeit. The Rolex Cyclops, are a magnifying lens above the date window on the face of the Rolex watches. The Cyclops (convex in nature) magnifies the date 2.5 times for ease of readability. If the one you are looking to buy has a flat magnification lens, which doesn’t magnify the date as it should; then you are looking at a fake. A genuine Rolex watch is supposed to feel heavy since it is made from real metals and crystals. If you spot one that seems a bit light, it’s probably because it is lacking some of the metals used in constructing the real ones, which automatically means, it's a fake. Being heavy is not conclusive proof that a Rolex is authentic though. One successful way to determine if Rolex watches are not genuine is to test their waterproof capabilities. All Rolex watches are built to be air tight thus leaving no room for water to enter them. If your watch is misbehaving after getting dipped into into water, then it’s not the real thing. The ability to differentiate between a fake and real Rolex watch depends on how well informed one is about Rolex watches. As you go shopping for a new one, keep these tips in mind to help you differentiate between the real thing and the myriad of clever imitations out there.